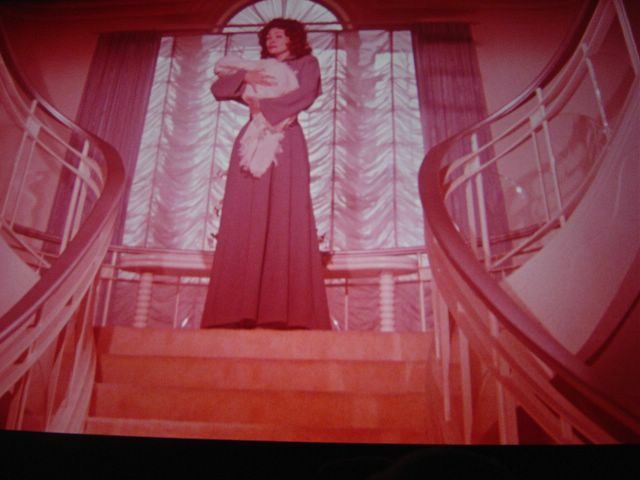 Last year I discovered the joys of CHELSEA CINEMA CLASSICS and I think the first thing I saw was MOMMIE DEAREST. I remember seeing this movie as a kid and being so upset and disturbed; mostly because it reminded me of my own childhood. Now I watch it, and while I still wince a bit in certain scenes, I can’t help but LAUGH OUT LOUD at the high drama and dialogue and mannerisms. This week was the anniversary of MOMMIE DEAREST night and some real enthusiasts showed up. This movie is nearing ROCKY HORROR PICTURE SHOW in audience participation. During swim scenes, squirt guns splatted us, for instance, and during part of the scene pictured above, the famous “NO WIRE HANGERS… EVER!!!! !” scene, was greeted with big puffs of baby powder floating across the audience, while hangers were thrown to the screen. Good God. I was as annoyed by the fun as I was having it. I wish more of you could join me and my pals for these nights out… they are SO fun! A LIVE SNAPSHOT DURING THE MOVIE! I had so much fun there last night! It was my first time ever seeing this movie, and what a way to be initiated! 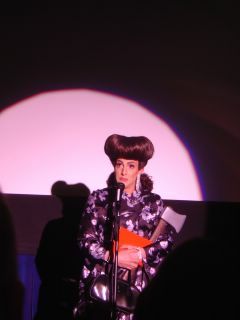 I even won a prize (free movie tix) in the raffle and had to go up in front of the sold-out audience to get it. Hedda simply said to me, “Get out of my light.” She’s funny and somewhat intimidating at the same time, especially in that wig!! I LOVE these kinds of “Rocky Horror” camp nights at the movies. In Vienna, I went to one of these for “The Sound of Music”. Austrians have a BLAST making fun of this film – there was a “Maria” contest and the movie was interrupted by a narrator (watch Countess Schraeder’s eyebrows). I had a TOTAL blast. 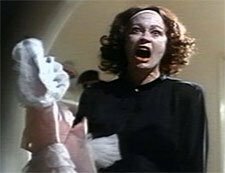 I’ve never heard of this with “Mommie Dearest” but I must see if this is done in California… I’m sure it is. I’m glad to see that you have finally come over to my side….